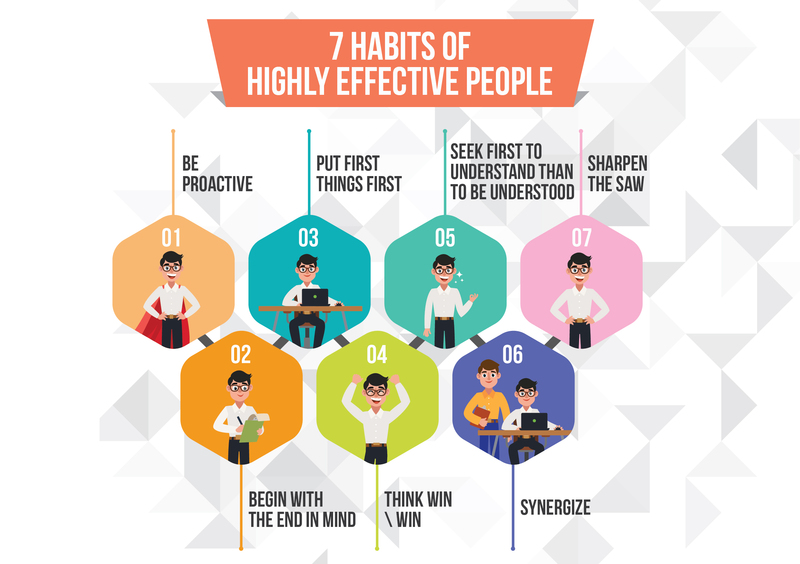 7 Habits of highly Effective People Summary is a complete project on 7 Habits and can also be used in training sessions as it also includes group activities and complete two hours session plan. Dr Stephen R Covey was born in 1932. He lives with his wife, Sandra, and their family in Utah; in the Rocky Mountains. Covey achieved international acclaim, and is perhaps best known, for his self-help book The 7 Habits of Highly Effective People summary. Which was first published by Simon & Schuster in 1989 and has sold around 12 million copies word-wide. Covey has a Harvard MBA and has spent most of his career at Brigham Young University, where he was professor of organizational behavior and business management. In addition to his MBA, he also has a doctorate which he completed whilst at Brigham Young University. Dr. Stephen R Covey has received the Thomas More College Medallion for continuing service to humanity and has additionally been awarded four honorary doctorate degrees. And not only to complete it, But also made us to realize to the effectiveness of a good trainer, And how a trainer can play his role to improve the over all working environment of the and eventually the Productive out-put for the organization. First published in 1989, is a self-help book written by Stephen R. Covey. It has sold over 15 million copies in 38 languages since first publication, which was marked by the release of a 15th anniversary edition in 2004. The book lists seven principles that, if established as habits, are supposed to help a person achieve true interdependent effectiveness. 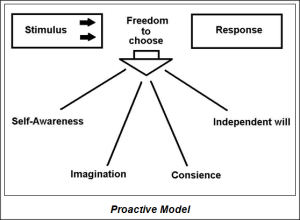 To provide a framework whereupon to build the 7 Habits, Covey begins his work introducing the dichotomy between what he calls the character ethic and the personality ethic. 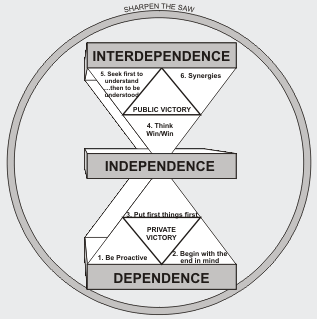 Covey’s first three Habits constitute what he refers to as the “Private Victory”. Before you can effectively manage and work with others, you must first learn to effectively manage yourself. This is the natural result of learning to integrate Habits 1 through 3 into your life. Having achieved the “private victory” with Habits 1 – 3, you now has the foundation necessary to move on to the more difficult “public victory”. The public victory happens when you learn to integrate Habits 4 – 6 into your life: Think Win/Win; Seek First to Understand, then be Understood; and Synergy. This is the habit of self-renewal and encompasses and supports all other habits. Just as any tool requires regular maintenance in order to function at its peak, you — the saw — require regular renewal or “sharpening” to remain most effective. One of the main things that separate us from the animals is the ability to consciously rem ove ourselves from our thoughts and observe our actions from a third-person perspective. This ability allows us to interrupt what many refer to as “instinct” or a conditioned response. Instinct is what causes us to respond to certain stimuli in the way that we do. For example, animals when confronted with a stimulus have a distinct response based upon their instincts. Humans, on the other hand, have the ability to stand apart from a stimulus, creating a gap between the two – effectively allowing one to decide how to respond. This is the definition of being proactive. Proactive also means that, as human beings, we are responsible for our own lives. Our behavior is a function of our decisions, not our conditions. There are three central values in life: the experiential (that which happens to us), the creative (that which we bring into existence), and the attitudinal (our response to difficult circumstances). What matters most is how we respond to what we experience in life. Proactive is grounded in facing reality but also understanding we have the power to choose a positive response to our circumstances. We need to understand how we focus our time and energy to be effective. The things we are concerned about could be described as our “Circle of Concern”. 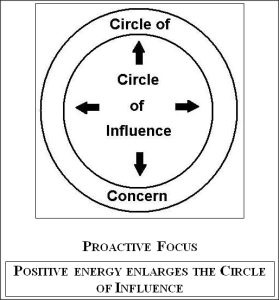 There are things we can really do something about, that can be described as our “Circle of Influence”. 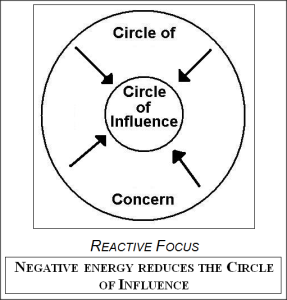 When we focus our time and energy in our Circle of Concern, but outside our Circle of Influence, we are not being effective. 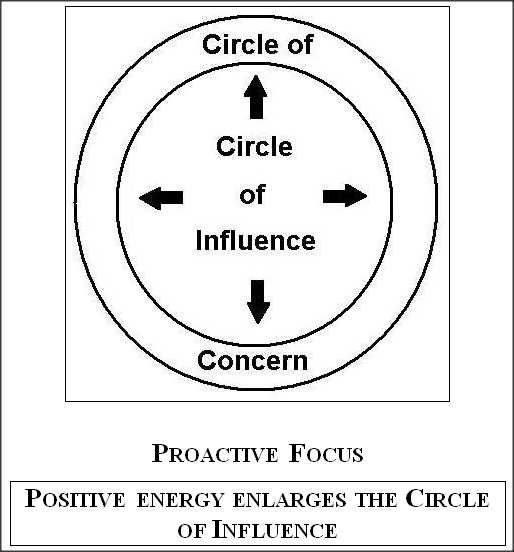 However, we find that being proactive helps us to expand our Circle of Influence. 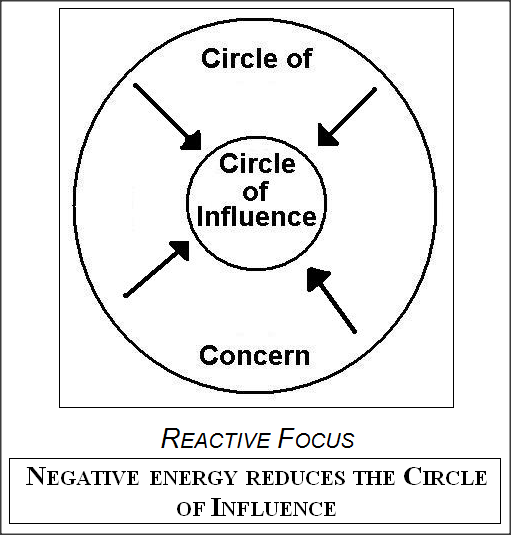 Reactive people focus their efforts on the Circle of Concern, over things they can’t control. Their negative energy causes their Circle of Influence to shrink. Sometimes we make choices with negative consequences, called mistakes. We can’t recall or undo past mistakes. Theme: I am free to choose and am responsible for my choices. We will call four or five trainees. Then we will explain them that you have to push the wall today. We will motivate them that you can do this. Finally after trying a lot those trainees couldn’t succeed. Then we will explain them that for pro-activeness it’s compulsory to have positive direction in your self. If you are utilizing your energy in on negative side then that is not actually your being pro-active, you have to achieve your goals by the ways that can really happen. Four people are required to move other have to observe either wall is moving or not. They have to move the wall with the physical effort except kicking. You can use your head also but no legs. Note: No damage is allowed. When we begin with the end in mind, we have a personal direction to guide our daily activities, without which we will accomplish little toward our own goals. Beginning with the end in mind is part of the process of personal leadership, taking control of our own lives. All things are created twice. We create them first in our minds, and then we work to bring them into physical existence. By taking control of our own first creation, we can write or re-write our own scripts, thus taking some control and responsibility for the outcome. We write or re-write our scripts using our imagination and conscience. A starting point in beginning with the end in mind is to develop a personal mission statement, philosophy or credo. It will help you focus on what you want to be (character), do (contributions and achievements) and on the values and principles upon which your being and doing are based. The personal mission statement gives us a changeless core from which we can deal with external change. Viktor Frankel developed a philosophy called “Logo therapy”. Logo therapy helps an individual detect his unique meaning or mission in life by reexamining his personal vision and values to assure they are based on principles and reality. We must reexamine the center of our life. Our center is the source of our security, guidance, wisdom and power. Making people or things outside ourselves important places us at the mercy of mood swings, inconsistent behavior and uncontrollable changes of fortune. Being self-centered is too limiting – people develop poor mental health in isolation. By centering our lives on correct principles, we create a stable, solid foundation for the development of our life support factors and embrace and encompass the truly important areas of our lives. 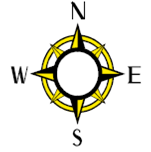 Successful relationships, achievement and financial security will radiate from the principle center. The principles we base our lives on should be deep, fundamental truths, classic truths, or generic common denominators. They will become tightly interwoven themes running with exactness, consistency, beauty and strength through the fabric of our lives. In developing your personal mission statement, you can use your creative ability to imagine life milestones such as birthdays, anniversaries, retirement and funerals. What accomplishments would you like to celebrate? Visualize them in rich detail. You can make your mission statement balanced and easier to work with by breaking it down into the specific role areas of your life and the goals you want to accomplish in each area. If you find your actions aren’t congruent with your mission statement, you can create affirmations to improve. An affirmation should have five ingredients: it should be personal, positive, present tense, visual and emotional. You can also use visualization techniques. Affirmation and visualization are both self programming techniques that should be used in harmony with correct principles. Mission statements can also be made for families, service groups and organizations of all kinds. A family mission statement is an expression of its true foundation, its shared vision and values. Organizational mission statements should be developed by everyone in the organization. If there is no involvement in the process, there will be no commitment to the statement. The reward system must compliment and strengthen the stated value systems. An organization may have an all-encompassing mission statement, and each location, or even each team, may have their own. However, they should all dovetail with each other. If the mission statements of your family and organization dovetail with your personal mission statement, and you use those statements to keep your end in mind, you will accomplish your goals more quickly and easily. We write something on the white board in Chinese language and asked someone from the group to read than he first not understand the language so he can’t read it than the concept is clear that begin his mind the language is Chinese so can’t solve the meanings of the words. It’s clear in our mind if we do violation of rule that we pay more money or sometime vehicle block or some time life gone. So it is always in our mind if we violate the rule something wrong with us. Habit 3 is Personal Management, the exercise of independent will to create a life congruent with your values, goals and mission. The fourth human endowment, Independent Will, is the ability to make decisions and choices and act upon them. Integrity is our ability to make and keep commitments to ourselves. Management involves developing the specific application of the ideas. We should lead from the right brain (creatively) and manage from the left brain (analytically). Prioritizing, clarifying values – integrating our daily planning with goal setting (The downside of this approach is increasing efficiency can reduce the spontaneity and relationships of life.). Managing ourselves rather than managing time – focusing in preserving and enhancing relationships and accomplishing results, thus maintaining the P/PC balance (production versus building production capacity). Quadrant I activities are urgent and important – called problems or crises. Focusing on Quadrant I results in it getting bigger and bigger until it dominates you. Quadrant III activities are urgent and not important, and often mis-classified as Quadrant I. Quadrant IV is the escape Quadrant – activities that are not urgent and not important. Effective people stay out of Quadrants III and IV because they aren’t important. They shrink Quadrant I down to size by spending more time in Quadrant II. Quadrant II activities are important, but not urgent. Working on this Quadrant is the heart of personal time management. Read the full article on Talent Management and Talent Management Process to know more about personal management. These are PC activities. Quadrant II activities are high impact – activities that when done regularly would make a tremendous difference in your life. (Include implementing the Seven Habits.) Initially, the time for Quadrant II activities must come from Quadrants III and IV. Quadrant I can’t be ignored, but should eventually shrink with attention to Quadrant II. Coherence – integrates roles, goals, and priorities. Balance – keeps various roles before you so they’re not neglected. Quadrant II Focus – Weekly – the key is not to prioritize what’s in your schedule, but to schedule your priorities. A People Dimension – think of efficiency when dealing with things, but effectiveness when dealing with people. The first person to consider in terms of effectiveness is you. Schedules are subordinated to people. 4) Daily Adapting – each day respond to unanticipated events, relationships and experiences in a meaningful way. balance your life by identifying roles. 5) It gives greater perspective through weekly organizing. The practical thread is a primary focus on relationships and a secondary focus on time, because people are more important than things. The second critical skill for personal management is delegation. Effectively delegating to others is perhaps the single most powerful high-leverage activity there is. Delegation enables you to devote your energies to high level activities in addition to enabling personal growth for individuals and organizations. Using delegation enables the manager to leverage the results of their efforts as compared to functioning as a “producer.” There are two types of delegation: Gofer Delegation and Supervision of Efforts (Stewardship). Using Gofer Delegation requires dictating not only what to do, but how to do it. 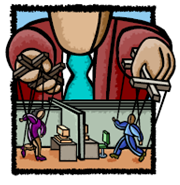 The supervisor then must function as a “boss,” micromanaging the progress of the “subordinate.” The supervisor thus loses a lot of the leveraging benefits of delegation because of the demands on his time for follow up. An adversarial relationship may also develop between the supervisors and subordinate. Desired Results – Have the person see it, describe it, make a quality statement of what the results will look like and by when they will be accomplished. Guidelines – Identify the parameters within which the individual should operate, and what potential “failure paths” might be. Keep the responsibility for results with the person delegated to. 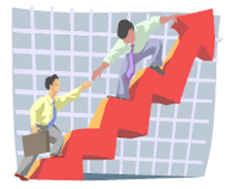 Resources – Identify the resources available to accomplish the required results. Accountability – Set standards of performance to be used in evaluating the results and specific times when reporting and evaluation will take place. 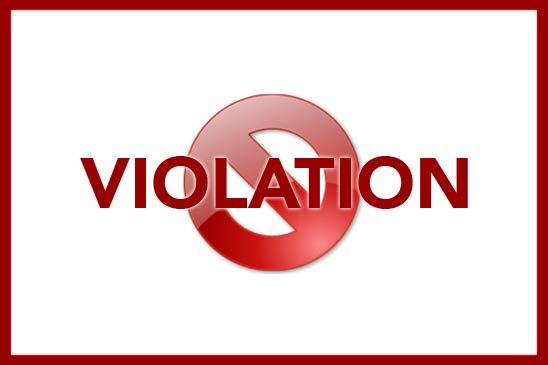 Consequences – Specify what will happen as a result of the evaluation, including psychic or financial rewards and penalties. This approach is a new paradigm of delegation. The steward becomes his own boss governed by his own conscience, including the commitment to agreed-upon desired results. It also releases his creative energies toward doing whatever is necessary in harmony with correct principles to achieve those desired results. Immature people can handle fewer results and need more guidelines and more accountability interviews. Mature people can handle more challenging desired results with fewer guidelines and accountability interviews. first we call some single person from a group and asked him to put off his socks when they put off their socks than he first putt off their shoes and then we asked him put off their socks why they put off his shoes first so we tell it’s a natural process that first things always first. we call someone from a group and asked him to get the SIM from the phone and then he open the phone backside than the battery of the phone and then get the SIM but I asked him to get the SIM but he first do the others things like the backside open and then get the SIM so first work always first. We call someone from the groups and asked him to make a knot of a tie so its first make the tie so first things always first. The semester system always move in a sequence means always midterm comes first than the end term. Midterm always come first not the end term. If you can achieve the private victory through living Habits 1 – 3, you would have made quite an accomplishment in personal effectiveness that not too many people reach. However, to reach quantum levels in effectiveness, you must learn to work with others. This is where the Habits 4-6 come into play. And Habit 4, thinking win/win, is just the beginning. Thinking win/win requires quite a paradigm shift in thinking for many people. Because our culture’s basis is competition — which in its own right is not a bad thing — it often triggers a belief in the scarcity mindset. This belief that there just isn’t enough to go around can be extremely self limiting. Thinking win/win is the first step in understanding that someone doesn’t always have to lose in order for you to win. By having this as your dominant mindset, you are constantly seeking out opportunities for mutual benefit in your personal and professional lives. Win/Win is one of six total philosophies of human interaction. authoritarian. In relationships, if both people aren’t winning, both are losing. based on acceptance. The leadership style is permissiveness. Win Focusing solely on getting what one wants, regardless of the needs of others. business relationship or enterprise. In a continuing relationship, it’s no longer an option. When relationships are paramount, Win/Win is the only viable alternative. In a competitive situation where building a relationship isn’t important, Win/Lose may be appropriate. There are five dimensions of the Win/Win model: Character, Relationships, Agreements, Supportive Systems and Processes. Competition has its place against market competitors, last year’s performance, or another location or individual where cooperation and interdependence aren’t required, but cooperation in the workplace is as important to free enterprise as competition in the marketplace. The spirit of Win/Win cannot survive in an environment of competition or contests. All of the company’s systems should be based on the principle of Win/Win. The Compensation system of the managers should be based on the productivity and development of their people. Identify the key issues and concerns (not positions) involved. Identify new options to achieve those results. The more you practice this habit, the more committed you will become as you find solutions which truly do benefit both parties, where originally it looked as if no such agreement might be reached. Covey has amended the wording of this habit slightly in recent years to read: Think Win-Win or No Deal. This attitude works well because it liberates the individuals concerned from the effort of trying to persuade the opposite party to shift ground or compromise. The group(s) who will done with this job he is in win-win situation because his one group member do the job first so he has win and now he is helping his other group members to complete this job so all the members do this and it will create a win-win situation. If purchased manager gets the required quantity at a reasonable rate from the supplier he will win and the supplier will lose it will create win lose situation. 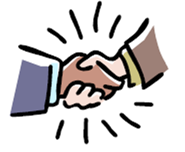 If both purchased manager and supplier are not able to communicate /bargain successfully for the required result and any transaction will not be held it will create lose-lose situation. If purchase manager gets the required quantity at a reasonable rate from the supplier and a favorable deal takes place between them it will create a win-win situation. Acquisition of Hajr-E-Aswad during the Re-construction of KHANA KABA. Seek first to understand or diagnose before you prescribe is a correct principle manifest in many areas of life. Its critical for the optometrist it’s critical for the physicians. You wouldn’t have any confidence in a prescription unless you had confidence in the diagnosis. A good engineer will understand the forces, the stresses at work before designing the bridge. A good teacher will assess the class before teaching. A good student will understand before he applies. Seek first to understand is a correct principle evident in all areas of life. It’s a generic, common denominator principle but it has its greatest power in the area of interpersonal relations. It means listening with intent to understand it gets inside another. It gets inside another person frame of reference. You look out through it you see world the way they see the world. In this type of listening you listen with your eyes and with your heart. You listen for feelings motives and interpretation you were dealing with the reality inside another persons head and heart. You listen for behavior you use your right as well as you’re left. Else is so powerful because it guesses you accurate data to work with. it is also by to making deposit in emotional bank account. 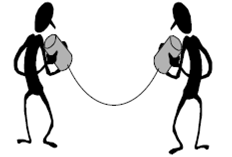 When u listen with empathy to another person you give that person psychological air and after that vital need is met then you can influencing or problem solving. As according to communication experts estimate in fact that only 10% of our communication is represented by the words we say. Another 30% is represented by our sounds and 60% by our body language. The skills, the tip of the iceberg of empathic listening, involve four developmental stages. The first and least effective is to mimic content. This is the skill taught in active or reflective listening. Without the character and relationship base it is often insulting to people and causes them to close up. It is however a first stage skill because it at least causes you to listen to what is said. Mimicking content is easy. You just listen to the words that come out of someone’s mouth and you repeat them you are hardly even using your brain at all. The second stage of emphatic listening is to rephrase the content. It is more effective but its skill limited to the verbal communication. The third stage brings your right brain into operation. You reflect feelings. The fourth stage includes both the second and the third. You rephrase the content and reflect the feeling. At other times they really need additional perspective and help. The key is to genuinely seek the welfare of the individual, to listen with empathy, to let the person get to the problem and the solution at his own pace and time. Layer upon layer it is like peeling an onion until you get to the soft inner core. We have gone through the skills of empathic listening because skill is an important part of any habit. If a person learns to listen deeply to other people, they will discover tremendous differences in perception. They will also begin to appreciate the impact that these differences can have as people try to work together in interdependent situations. Our perceptions can be vastly different and yet we both have lived with our paradigms for years, thinking they are facts and questioning the character or the mental competence of anyone who can’t see the facts. Seek first to understand then to be understood. Knowing how to be understood is the other half of habit 5 and is equally critical in reaching win/win solution. Earlier defined maturity as the balance between courage and consideration seeking to understand requires consideration seeking to be understood takes courage. When someone can present their own ideas clearly, specifically, visually and most important, contextually in the context of a deep understanding of their paradigms and concerns that something is significantly increasing the credibility of your ideas. Habit 5 lifts you to greater accuracy, greater integrity in your presentations and people know that they know you are presenting the ideas which you genuinely believe, and taking all knows facts and perceptions into considerations that will benefit everyone. Habit 5 is powerful because it is right in the middle of your circle of influence. Many factors in interdependent situation are in your circle of concern problems, disagreements, circumstances, and other people behavior and if someone is focus your energies out there you deplete them with little positive results. Habit 5 is something you can practice right now. Seek first to understand before the problems come up, before you try to evaluate and prescribe, before you try to present your own ideas seek to understand. It’s a powerful habit of effective interdependence. They become the stepping stones to synergy. The trainer will be telling a story, during the whole story he will be using the word “DON’T KNOW” on all those critical points to be told by him. After the story he will ask the trainees what they actually understand by the story. Now in the end he will again tell the whole same story but with filling those blanks in which he used the “don’t know” word. Hence in the end concluding the topic as if one thing is not understand by any person how he can make others to understand. An act will be performed by the trainer. Showing that one should first seek to understand other rather to make them to understand him first. The exercise of all of the other habit prepare us for the habit of synergize. When properly understand, synergy is the highest activity in all life. Synergy is the essence of principle-centered leadership and parenting. It catalyzes and unifies the greatest powers within people. All the habit we have covered prepares us to create the miracle of synergy. Simple defined it means that the whole is greater than the sum of its parts. It means that the relationship which the parts have to each other is a part in and of itself. It is not only a part but the most catalytic empowering, unifying and the most exciting part. Synergy is everywhere in nature. If you plant two plants close together, the roots commingle and improve the quality of the soil so that both plants will grow better than if they were separated. 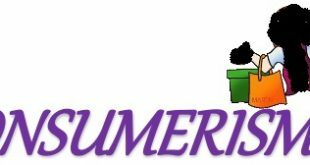 When you communicate synergistically you are simply opening your mind and heart and expressions to new possibilities, new alternatives, and new options. It is like that you are casting aside habit 2 that is to begin with the end in mind but in actual you are doing its opposite you are fulfilling it. Many people have not really experienced even a moderate degree of synergy in their family life or in other interactions. They have been trained and scripted into defensive and protective communications or into believing that life or other people can’t be trusted. As a result they are never really open to habit 6 and to these principles. Synergy tests whether teachers and students are really open to the principle of the whole being greater than the sum of its parts. There are time when teachers and students were not sure that what is going to happen. In the beginning there is a safe environment that enables people to be really open and to learn and to listen to each others ideas. Then comes brainstorming where the spirit of evaluation is subordinated to the spirit of creativity, imaging and intellectual networking. Then absolutely unusual phenomena begin to take place. Synergy is almost as if a group collectively agrees to subordinate old scripts and to write a new one. An activity will be performed by the trainees in groups. Each group will be given four bottles and four butter knifes. By applying the concept of mutual and equal effort by all group members in any org they can perform well, they have to perform it. Place 3 bottles in such a way that butter knife can pass through each 2 bottles horizontally. Now put 3 butter knives on top of bottles in such away that at least 1 end of each knife touches the top of the bottle as well as the knives touch each other then place the 4th bottle on the knives. The groups will be provided with five minutes to perform the task. In not completed. Then it will be preformed by the trainer. About the game in which two member of any team will have to tie their foot and all other such participants have to do the same act. Now they have to race for a finishing point. In the example it would be discussed that which team wins the race. This point will be raised by questioning the trainees. As an answer to the question they will come to the result that people who perform as team player in any task or in any job they can produce effective result. Let us begin by considering Spiritual Exercise – this is the area which is perhaps the most misunderstood. I believe that, in the west, we have become spiritually blind. The progress of our science, education and technology has led us to construct a view of the world and the universe that excludes the agency of God. Freud famously said that it was man that made God ‘in the image of his father’. It is, of course, a very clever statement and not one I wish to here challenge – whether this statement or the reverse is true is for you to decide. However, as the west has, by and large, abandoned faith in the creator God, so it has simultaneously abandoned the idea that life has any meaning or purpose; and it is purpose and direction in life that this habit refers to as Spiritual Exercise. Of course, if you are a religious person, then there will be a tie-up here with your personal faith; however, if you are not religious, don’t also abandon the idea that life holds a special purpose for you. Stephen Covey means when he talks about spiritual exercise – the regular, review and preview of the things that are most important to you in life. These are the first things that you must define in habit 2 – Begin with the End in Mind. Ask yourself these questions. What am I doing to sharpen my mind? Am I engaged in a program of education or learning of some kind? What am I doing to improve my professional knowledge? How you should go about this part of the habit is, of course, for you to decide, but you should ensure that you are reading regularly. What should you read? Naturally you want to put in the good stuff – so it’s not a case of reading for its own sake; it is reading carefully selected material which allows you to broaden and deepen your understanding. You will naturally be paying particular attention to the important areas you defined in habit 2, but you should also consider reading all the great works of literature and also ancient wisdom literature which includes books like The Psalms and Proverbs. This part is not really a discipline, as are the other three parts, it is really a commitment; and for me, I make the commitment during the spiritual part of the habit, that is, during a meditation. It is simply to commit to approaching inter-personal relationships by making use of habits 4, 5 and 6. 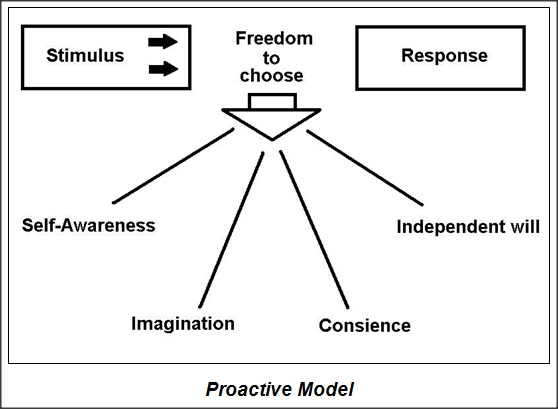 Even if people approach me making use of language, actions, or behavior which I personally believe to be inappropriate, my commitment is to not react, but to use my proactive capacity to engage in the exercise of habits 4, 5 and 6 which I believe will lead to the best possible outcome in such circumstances. An act will be performed by the trainer with the help of other trainer. In this act life of a person that is affected by the workload and imbalance in his family and work life. Eventually the man will end up in his family crises. Two Hour Sample Training Session Plan.